Desiring a more luxurious master bathroom with walk-in closet, and a larger office/study on the first floor, the homeowners also were able to receive a walk-out basement access to the backyard pool and a powder room for guests. Bumping out the downstairs office provided another opening onto the backyard deck. The Master Bath now boasts a double vanity and make-up area, radiant heat flooring, a new soaking tub and a 3-foot by 5-foot shower with a granite seat. The new walk-in closet is completed with an organizing system. The expanded first floor office has views of the pool, deck and hills in the distance. 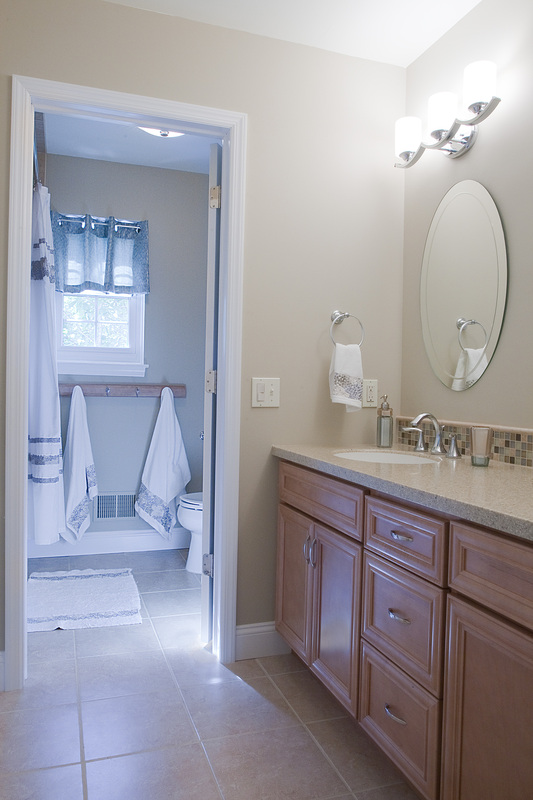 The homeowners wanted a second floor hall bathroom with easier access to the bathtub, which should not leak; more and better storage; separate spaces for each of the two children; a sophisticated, kid-friendly space; and a controlled budget. To assist the homeowner in achieving the desire dlook, a unique design approach was taken: packages were created detailing all fixtures, finishes and labor costs at different price points so they could make their choices based on a complete budget analysis. Sacrifices were made along the way to achieve the new bathroom within budget. because the existing tub was cracked and leaked into the powder room below, a new tub, deeper for soaking, also wider, required the drain to be re-centered. part of the ceiling in the powder room was remodeled to access the tub plumbing. Several child-friendly details were integrated, including separate spaces with mirrors, outlets, accessories and lights help to minimize arguments. The project included converting the existing second floor laundry room and storage room over the garage into a walk-thru closet, new bathroom and washer/dryer enclosure. With a magazine photo in hand, the homeowners asked for the project to be designed and built into a sloped roof space. To accomplish their needs, a new roof window was cut in, as well as a new end wall window. Plumbing fixtures for the tub, shower, toilet and lavatory were installed as well as custom cabinetry in the bathroom and closet area. The existing washer and dryer location was closed off with doors to conceal the utility area. A wide screen TV was mounted to be visible from the tub and shower. The new area provides a functional suite for the homeowners’ daughter! Desiring an extension of their outdoor living area from the existing raised deck, the homeowners wanted access to their sloping backyard. The deck actually was disconnected from the yard due to its height and lack of steps down into the area. By installing a raised bluestone patio, adding new wood steps from the deck to the patio, and stone slab steps to the lower yard, Landscape Aesthetics created a flowing transition for the homeowners. Re-grading and re-contouring the backyard drained water away from the structure, allowing the existing deck to be retained, and the project to come in within budget. The outdoor fireplace and cooking area were positioned to provide views of the existing natural pond on the property. New plantings and an inviting walkway into the backyard complete the project. M.J. Cushing & Associates, Inc. This home has a wonderful eastern view of the sunrise, of which the homeowners wanted to take advantage. While they desired a relaxing outdoor respite, they also required it to be low maintenance. 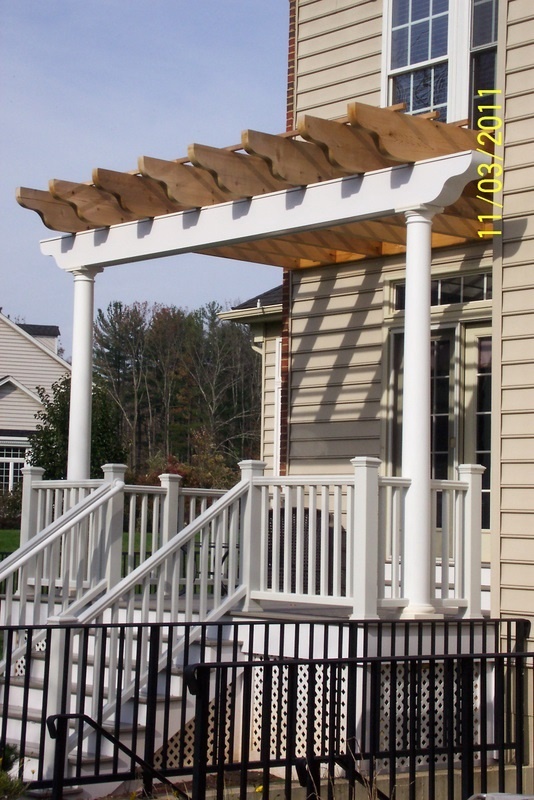 By using composite decking and railing and composite matierial wrapped around the CCA lumber of the support beams and deck framing, and vinyl lattice. M.J. Cushing created the desired space. 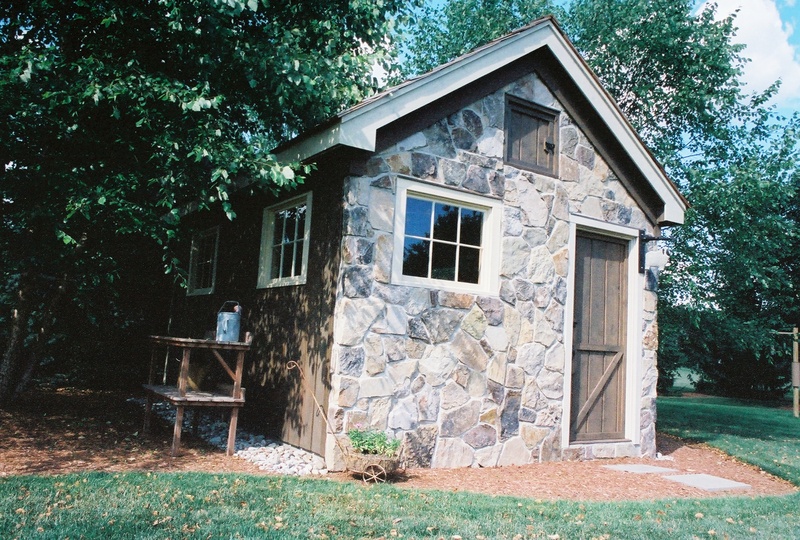 When these homeowners requested a new shed, they explained they did not want a pre-fabricated look, but a traditional New England-style out building. The winter of 2011 did not cooperate with the homeowner and the contractor, who used every means to work through the snowstorms, including tarping the unit and using portable heaters to aide the progress of the stonework. The roof is finished with hand-split shingles, while the exterior also boasts vertical rustic channel siding. Tru-divided light stationary windows allow natural light into the building. Even the door was custom built with rough sawn materials to complete the look. This Hunterdon County homeowner had a “laundry list” of things she wanted to include in one of the most often overlooked rooms of the house. A spot to fold clothes, storage for shoes, gloves, hats and scarves, location for mounting the central vacuum cleaner hose to the wall, a utility sink, hooks for mops and coats, and a drying rack all had to be accommodated and coordinate with the décor of the kitchen. Increased difficulties were encountered in installing cabinets the height of the washer and dryer, and the need to raise the plumbing plumbing and electrical hookups above the countertop. A custom cabinet was designed for storage of laundry products, which provided easy open/close options. The closet was redesigned and compartmentalized to meet the needs of the homeowner. In updating the entire first floor of this 21-year-old home, Houghton Contracting was lucky not to encounter any extreme obstacles so they could accomplish this project within budget. Pulling up carpeting and laying hardwood flooring thoughout the foyer, dining room, living room, family room and kitchen adds to the renewed feeling of the project. Opening the kitchen into the family room, removing the knee wall between the room and adding an island as dividing space provides more storage and countertop for the homeowners. The finishing touches of crown moulding and updated base moulding and window casings add to the ambiance of the home. 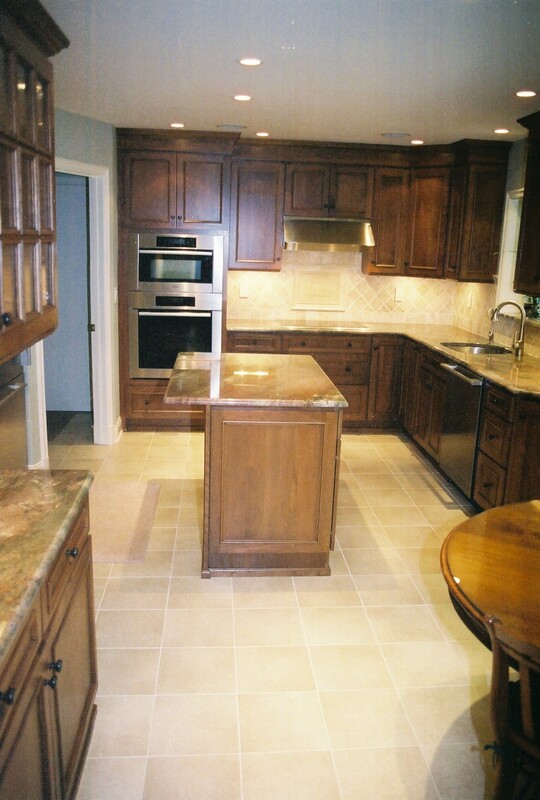 Condo kitchens can be frustrating when remodeling because expanding the room is not an option. When this Flemington homeowner complained of her lack of space, the stove next to a wall, inability to fit a table in the area, and the refrigerator door blocking access to the room when open, she was concerned that not much could be done. Re-configuring the traffic pattern and relocating the appliances were key to achieving the desired results. 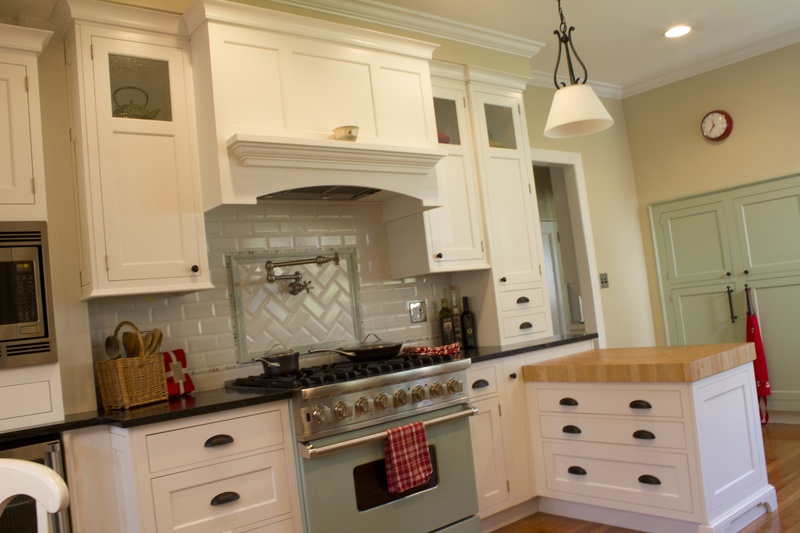 The original kitchen had what are called “blind wall corner cabinets” over the sink. By installing full-size wall cabinets with mullion glass doors, the homeowner has more usable space and easier access to the contents. The kitchen window was cold and drafty. It was discovered the window box was cantilevered with no insulation. By pulling back the siding and installing sprayfoam insulation, a more comfortable area can be enjoyed. Designing a peninsula with seating provides more storage and the space for enjoying in-room meals. The list of complaints these homeowners had concerning their existing kitchen seemed endless: not enough storage, not comfortable for more than one person to work, tight access and nowhere to sit, etc. Several design options were prepared, with budget considerations explained, so homeowners could make intelligent, effective choices on what could be accomplished. The decision to knock out the laundry room and reposition it in the basement, plus open up the closet were good things because in opening up the walls it was discovered the house’s original beam was undersized and sagging by 3/4-inch. Also, ceiling joists were resting on a non-load bearing wall. MSI Plumbing + Remodeling with team member Aurora Kitchens & Interiors were able to create a structurally sound and fully functional kitchen for the homeowners. 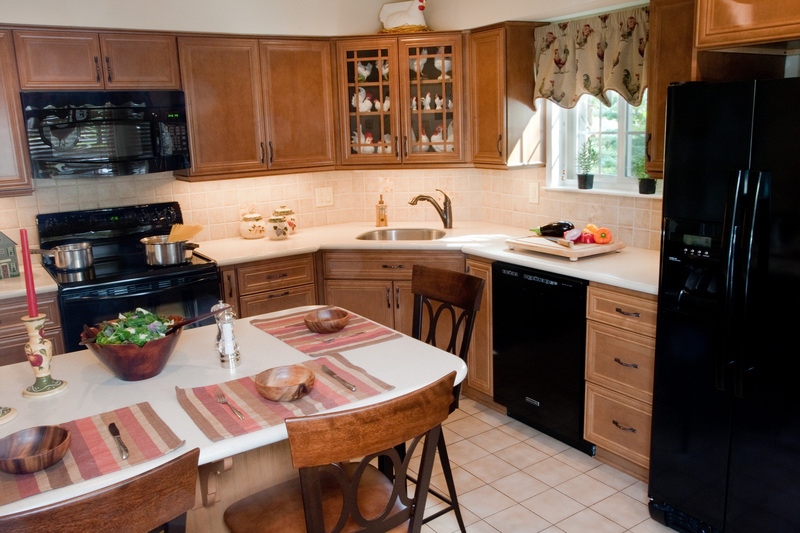 Updating a 1960’s kitchen has its difficulties, especially when the room has its own impediments, such as a wall oven that juts out into the traffic flow...Plus, today’s homeowners desire more storage space, and an energy-efficient area! With technological advances in sprayfoam insulation and window efficiencies, K+D Contractors was able to provide a warm, aesthetically pleasing and functional kitchen with increased daylighting and work space. Re-locating the oven, closet, and laundry room door, and installing taller cabinets, established increased storage and better traffic flow. Not only did the homeowner receive a more beautiful, bright and cheery kitchen, but also an effective one for the family to enjoy. Updating a builder’s grade kitchen in a 1996 home with a growing family required relocating everything! An entirely new room layout was designed with a new Prairie-style window bringing in more light and creating a focal point from the front door. Radiant heat was installed under the tile floor and a leathered look 9-foot center island was created for the family to work and dine together. Providing the family with amenities they enjoy, a smoothie bar was incorporated into the peninsula overlooking the family room. In creating such a large space there was a need to offer visual distinctions; a unique marble backsplash in three-dimensional wave pattern attracts the eye, and two different patterns of granite countertops designate eating areas and work spaces. When people think of auto body shops, what come to mind are oil, grease, dirt, and grime. A new breed of auto body shop is making its debut. The goal of this project was creating a space in which customers would feel comfortable. Designing a space that is clean and inviting has its challenges since mechanics often track oil and grease from the shop into the waiting area when speaking with customers. Flooring was key to cleanliness and maintenance. A concrete floor topped with a multi-tile pattern carpet was selected for durability. 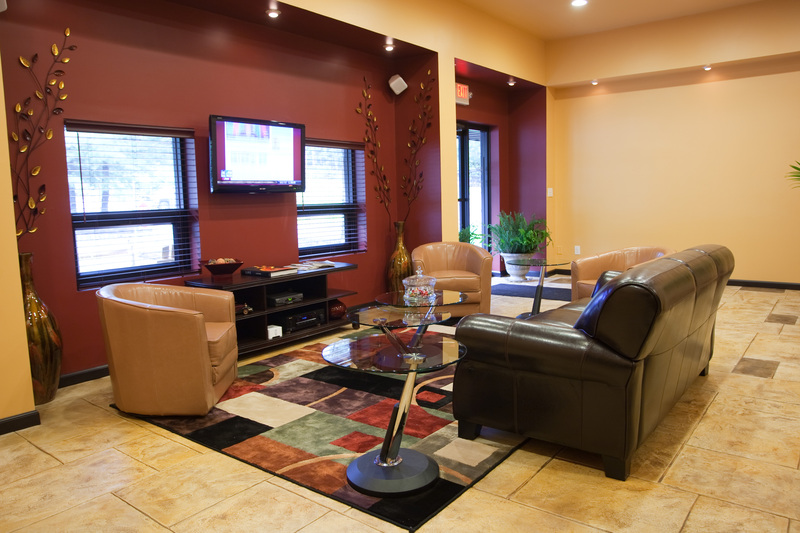 Leather chairs and sofa create a seating area with access to TV and wireless internet. Decorative details complete the upscale feeling.